'Early Bird’ combines the graduated skies of West's CGI video work, with the symmetrical ‘machine faces’ that now sit as a branded monogram to larger sculptural pieces. The graduated sky marks the beginning or end of a day, sunset and sunrise – but it’s hard to tell exactly which. In the videos, a machine landscapes play out in an endless loop, the skies above remain fixed, time never moves as the work performed rolls ceaselessly on. 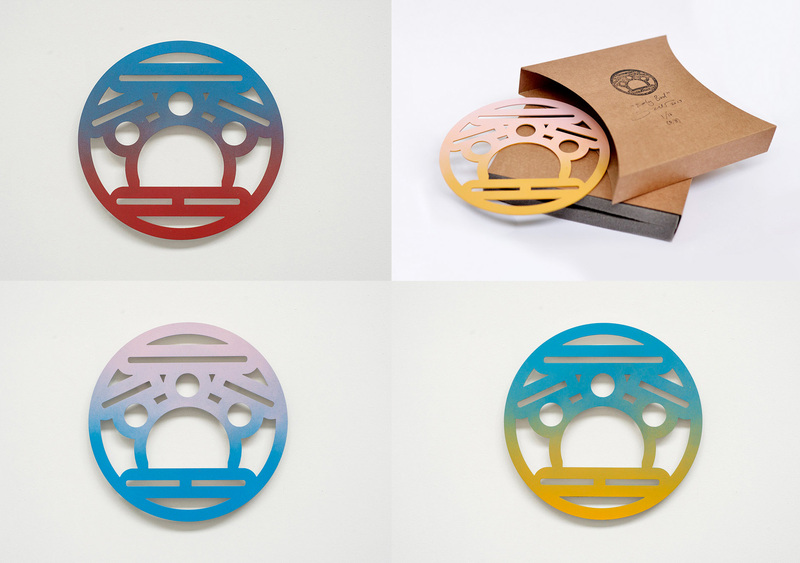 The geometrical patterns of the laser-cut discs originally took their cue from the functional slots and holes cut into machinery parts that only reveal themselves when the machine is taken apart. These holes have the uncanny ability to trick us into seeing faces and are abstracted into mask-like, fetishized objects that look on the machine world as an act of ritual. Both 'Early Bird' and our previous edition offer on Alan Magee's 'Shatter Resistant' are now on view by reception.